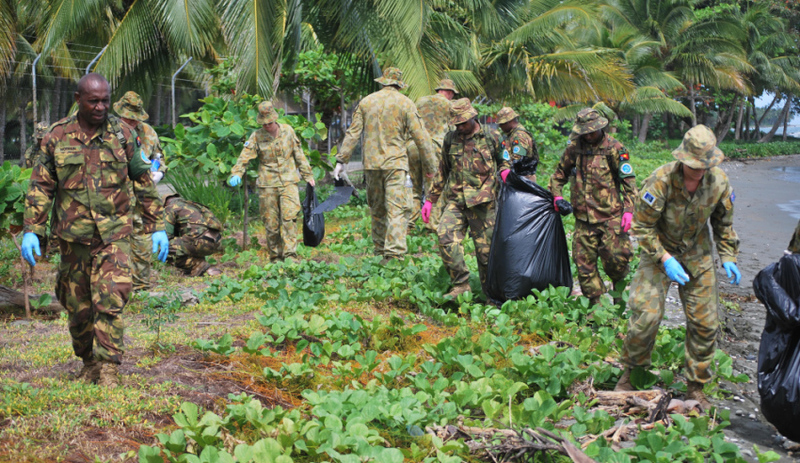 Volunteers from Combined Task Force 635 (CTF635) took action to protect and improve the Solomon Islands’ environment. Image via Commonwealth of Australia, Department of Defence. Climate change is a “threat multiplier” increasing the risk of conflict and pushing up the demand for Australian Defence Force operations nationally and internationally, the Department of Defence has told a parliamentary inquiry. Defence is one of the many departments to give evidence to the foreign affairs, defence and trade committee inquiry into the implications of climate change, with Defence warning that climate change could intersect with other serious issues including population density, poor governance, weak government institutions, poverty and adaptation risk. "The national security threats that may emerge include inter-group rivalries, water, food and resource shortages and irregular migration," a submission from the Department of Defence said. "Many of the states in Australia’s region face some or all of these challenges, in addition to being vulnerable to climate change impacts such as temperature and sea level rise. Unmitigated, climate change could exacerbate the potential for conflict and the consequence of any climate change-related threats could lead to an increase in the demand for a wide spectrum of Defence responses." The department also cautioned the impact of climate change on Australia's neighbours in the south Pacific could increase the threat of terrorism in the region, as well as intra-state conflict. "When climate impacts are combined with ethnic or other social grievances, they can contribute to increased migration, internal instability or intra-state insurgencies, often over greater competition for natural resources. These developments may foster terrorism or cross-border conflict," the submission said. "For example, climate change has been assessed as a factor in the drought and subsequent food shortages in the Middle East prior to the Arab Spring. Combined with political and social factors, climate change as a threat multiplier helped exacerbate many of the current conflicts in that region, including in Syria, and contributed to the current emerging refugee crises in Africa." Defence also told the inquiry it is aware it may need to offer more response than it is currently prepared for to disasters and border security operations, as well as illegal foreign fishing, as early as the middle of the next decade. "Defence may also be expected to provide increasing levels of emergency assistance to the civil community if the size and scale of Australian natural disasters increase," the submission said. "Modelling of Defence’s future preparedness posture currently indicates a manageable near-term increase in the frequency, scale and operational risk of climate-related Defence commitments. However, the forecast level of commitment may create concurrency pressures for Defence from as early as the middle of the next decade, or earlier if climate change related impacts on security threats accelerate." Australia's 2016 Defence White Paper included climate change in one of its six key drivers of Australia's security environment to 2035, with the watershed paper anticipating higher chances of deployment and increased threats to Defence infrastructure, including bases. Planning assumptions on the frequency and scale of response were revised accordingly for the development of the Chief of Defence Force’s Preparedness Directive for 2017-18 and work is currently ongoing in forecasting climate change impacts on Defence missions and mission environments, with a view to informing Defence preparedness requirements. The inquiry is expected to finish this month, with a report due later this year.